With any luck, this week’s nor’easter may have been the final snow day for the Windham/Raymond School District. However, this is Maine, so it won’t hurt to have a Snow Day Plan in place just in case. As the snow was flying outside, our family decided to take on an ambitious kitchen project: making homemade marshmallows! It turned out to be the perfect snow day project. Preparing the marshmallows took all day, included a few suspense filled moments, and gave us the satisfaction of realizing we can transform a few simple ingredients into something amazing. Making homemade marshmallows is almost alchemy. My husband, who has his Ph.D. in organic chemistry, handled the tricky first step of heating the sugar solution to the required temperature. He cautions that this step should be performed by an adult, and you should not try to do anything else while stirring the sugar, because a few missteps could lead to an enormous, sticky disaster. This part of the marshmallow cooking process also requires a candy thermometer, in addition to adult supervision. A Ph.D. in chemistry is not required, I promise! The second step requires either a stand mixer, or a hand-held mixer and a fair dose of patience. Watching the sugar solution and gelatin come together to form the recognizable color, taste, and texture of marshmallow fluff is a moment of kitchen magic for the kids, which can be sorely needed while they’re cooped up inside during a snow day. This marshmallow recipe, which originally appeared in The New York Times, also calls for at least four hours of “rest,” which is the perfect opportunity to watch a movie (I suggest Academy Award winner “Coco”) or to have a kids-versus-adults snowball fight. The kids will probably win that one; they always have more energy. After resting, the marshmallows are ready to be sliced and tossed with powdered sugar, a process which resulted in lots of giggling and an enormous snow-day mess. My seven and three-year-old assistants were delighted to discover that the final product tasted just like marshmallows. The adults were slightly less than delighted to discover the final product tasted like marshmallows, because even the very best marshmallow tastes sickeningly sweet. Yet, when these marshmallows were dunked in a steaming cup of hot chocolate, the very best kitchen magic of all occurs. The marshmallows take on the flavor of chocolate, the hot chocolate turns creamy and even sweeter, and a snow day spent at home turns into a childhood memory. Pour 1/4 cup of cold water into the bowl of a stand mixer, and then sprinkle the gelatin powder evenly over the top. Set aside. Affix a candy thermometer to the side of a heavy saucepan, then add 2 tablespoons of water, sugar, corn syrup, and salt. Stir to combine. Cook over medium heat while stirring, until the mixture reaches 245 degrees. The mixture will be very hot, so this step required adult supervision! Scrape the gelatin and water mixture off the bottom of the mixer bowl, and then attach a whisk attachment and turn the mixer on medium speed. Carefully pour the hot sugar solution down the side of the mixing bowl. Once all the syrup has been added to the gelatin, turn the mixer speed to high and whip for 10 minutes. The mixture will look like marshmallow fluff! Add the vanilla extract and whip for an additional 30 seconds. Grease an 8 inch by 8-inch baking dish and then coat with 1/2 cup powdered sugar. Scrape the marshmallow fluff into the baking dish, then pat into an even layer. Sprinkle another 1/2 cup of powdered sugar on top of the marshmallow mixture, then let the marshmallows sit uncovered for at least four hours (or as long as overnight). 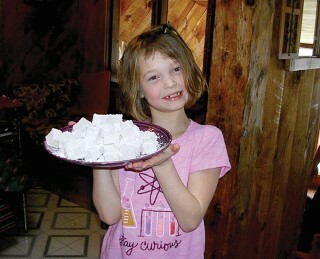 and slice the marshmallows into bite-sized pieces and toss the pieces in a bowl filled with a half cup of powdered sugar. You could even use a cookie cutter for this step! I suggest serving the marshmallows with a steaming mug of hot chocolate.